Designed by Esther Smith Bozak, Copyright 1995. All rights reserved. This pattern is being revised and that revised version will be available as soon as it is ready for release as a little white dog design(TM) pattern. Due to circumstances beyond my control, the revised version will not be available until sometime after the New Year. 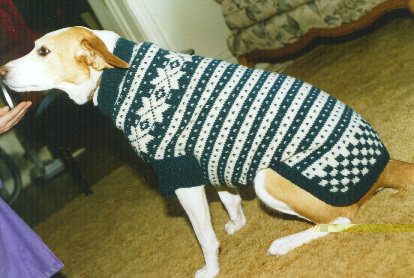 Winter is nearly upon us here in North America, and I know there are many of you who wish to knit sweaters for your dogs. 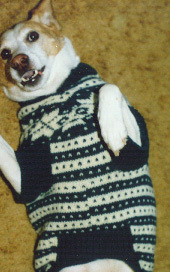 So, I am making the unrevised version of the Original Custom Fit Dog Sweater available for use this winter. Check back later this week for it.